March 15, 2015 By Elizabeth Lindemann 15 Comments / This post may contain affiliate links. Crunch crunch crunch nom nom nom. 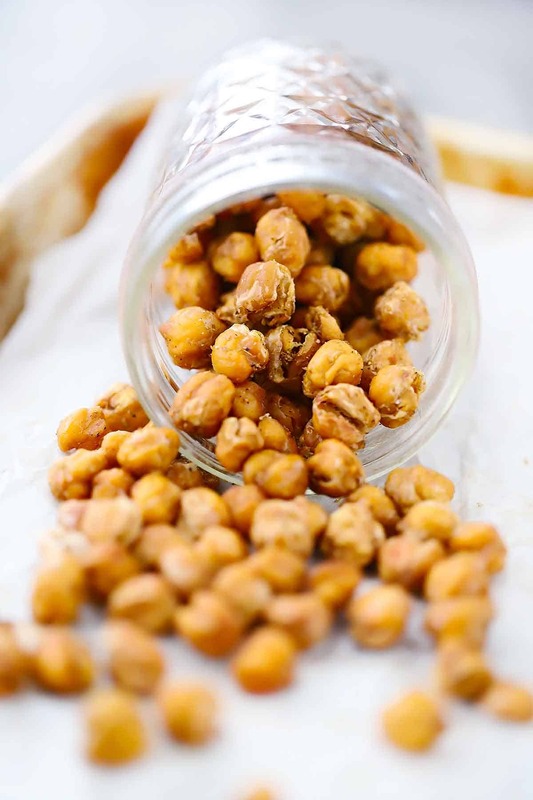 Oh, pardon me, I was just noshing on the most addictive snack ever… Crispy Spicy Roasted Chickpeas! These are yummy, spicy, crunchy, and versatile… and they couldn’t be easier (or cheaper!) to make. Not to mention they are high in fiber, high in protein, and low in fat, which makes them the perfect guilt-free energy boosting midday munchie. I always find it difficult to find healthy snack foods that I actually WANT to eat. Fruit is usually my go-to healthy snack, but sometimes you just want something salty, savory, and crunchy to munch on. Like… potato chips. Or Flaming Hot Cheetos. Or Pringles. These things can be hard to resist if you don’t have an adequate alternative. 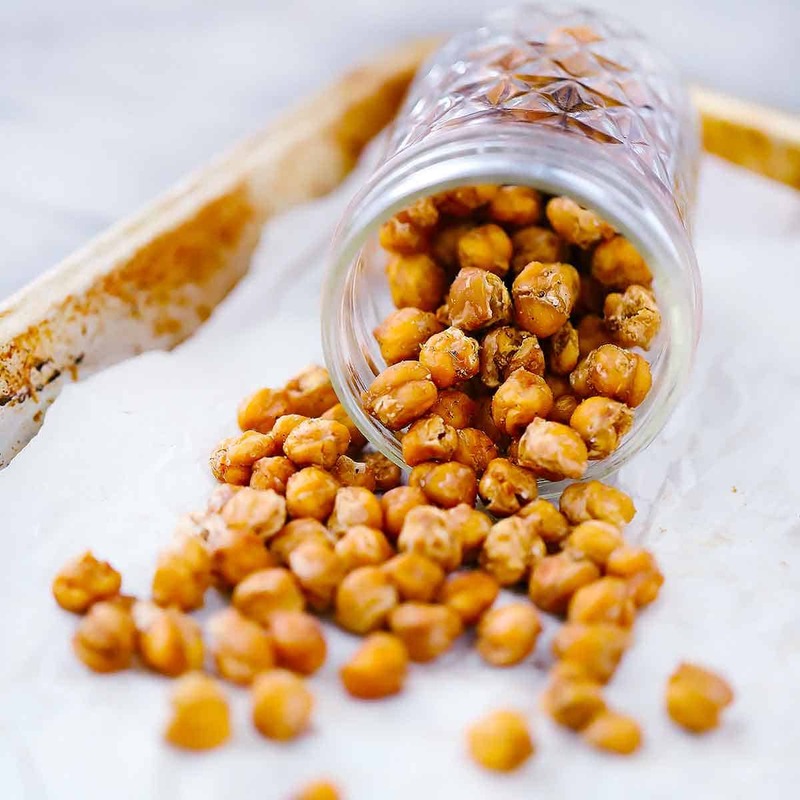 Roasted chickpeas are an awesome, healthy substitute for these not-so-healthy snacks, and will give you that salty and flavorful crunch you are looking for with completely natural, unprocessed ingredients. You can eat them on their own, add them to a trail mix, or even use them in place of croutons in a salad. And while I used cayenne pepper and cumin to season mine, you can certainly keep them simple and season only with salt, or make them sweet by adding honey and cinnamon to them. YUM! If you’ve ever made roasted chickpeas before, perhaps you’ve run into the problem that they are delicious fresh out of the oven, but tend to get a bit soggy after a day or so. Here’s how to make Crispy Spicy Roasted Chickpeas, plus a top-secret awesome tip to making them stay crispy and crunchy on the shelf for days. The method for making these is similar to roasting pumpkin seeds. Just drain and rinse some cooked chickpeas, and pat dry with a paper towel. Mix in a bowl with just a little bit of olive oil (if you use too much, the chickpeas may “pop” in the oven, or become soggy), salt, pepper, cayenne pepper, and cumin, then spread on a parchment-covered rimmed baking sheet. Bake at 400 degrees for 30-40 minutes. Now, for the top-secret awesome trick. After you are done roasting, turn off the oven, and allow the oven to cool with the chickpeas still inside. The key to the crunchiest roasted chickpeas is to completely dehydrate them. Food is usually dehydrated at a low temperature for a long amount of time. 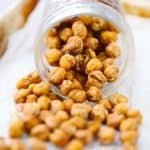 By allowing the chickpeas to continue to cook at a low temperature after roasting at a high temperature, you will continue to cook the inside and dehydrate the chickpeas completely without burning them. Leave them in until the oven cools, or even as long as overnight. I made these last night while I was baking meatloaf, in preparation for snacks for this upcoming week. It’s easy to throw them in the oven with other things you are cooking, since there is so little prep involved, to save time and not waste energy cooking them on their own. I turned off the oven and, while we were eating, I kept the chickpeas in the oven until they were cool. When we cleaned up from dinner, I was able to transfer them to a mason jar to store. These will stay crunchy and fresh stored in an airtight jar or container for a few days and up to a week at room temperature. Want more roasted chickpea recipes? Try these! These crispy spicy roasted chickpeas are yummy and addictive! High in fiber, high in protein, low fat... a guilt free snack! Spread chickpeas on prepared baking sheet evenly so they aren't touching as much as possible. Do you move them around on the baking sheet while cooking to ensure an even crisp on all sides? I haven’t tasted them yet but at only 15 minutes they started burning..burning to the point where my smoke alarm went off. Oh no! So sorry that happened. My instinct is telling me that perhaps you forgot the oil? This seems like something that would happen if the chickpeas were too dry. Other than that, maybe your oven rack was placed really close to the top of the oven or something? Or maybe your oven just runs really hot. This has never happened to me when I’ve made these, or anyone else that’s made them, and it’s very similar to many other roasted chickpea recipes out there. 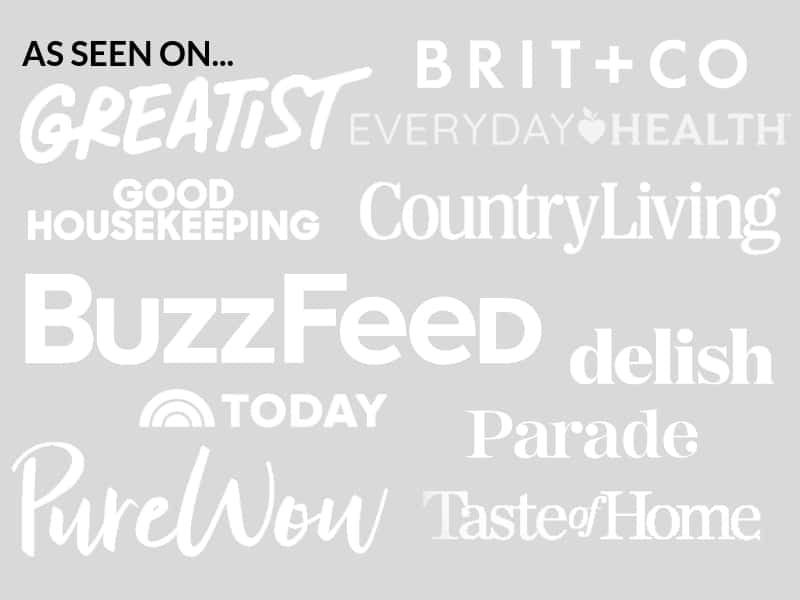 If you happen to try it again, whether it’s my recipe or someone else’s, I’d check to ensure that there is definitely oil, and maybe try a lower temperature for your oven. Hope that helps! Hey! Looks delish! Do you think I could roast and then dehydrate in the dehydrator?? Thanks! I was searching for a healthy snack when I came across this recipe. My husband said there was no way he was eating chickpeas. He liked the smell when they were cooking. So I was able to get him to try just one. Now I have to increase the amount I make because he’s eating them up on me! Thanks for sharing this recipe!! So happy you and your husband liked them! They taste so different when they are roasted- glad you got him to try them! Thanks for the recipe, I have been wanting to try these for a while! I have made these before but didn’t quite come out perfect but they were still yummy. I am trying them again but this time I am following the recipe. I will let you know how they came out. I have been searching for chickpea croutons, and I have to tell you that these ones seem really good. Thanks a lot for the tip about leaving them in the oven.